When it came to getting married again, Katie Couric put her mind to it. The 56-year-old journalist and TV personality, whose first husband, Jay Monahan, died of colon cancer in 1998, tells People magazine in its September 16 issue that she made finding love again one of her top to-dos. 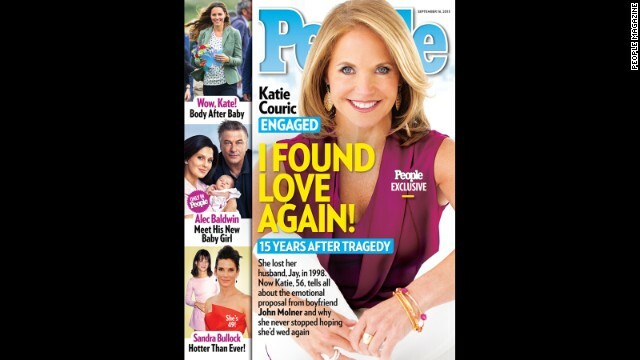 "I knew that I wanted this," Couric tells the magazine of finding a spouse. "I made it a priority, and I pursued it with some purpose." That pursuit paid off over Labor Day weekend, when Molner whisked Couric off to the beach in East Hampton to ask for her hand. And even though Couric was looking to settle down, Molner's proposal initially caught her off guard. "He said that there was a reason he'd brought me there to the beach, and that he loved me and was committed to me, and I said, 'Yeah, I know that, you didn't have to bring me here to tell me that,'" Couric recalls. "Finally he said, 'Couric, I'm trying to propose to you,' and I was stunned." The "Katie" daytime host was so stunned at first that she couldn't even respond. "It took me a while to say yes, because I was so confused!" Couric says. Once she finished processing what was going on, Couric is said to have "ecstatically" accepted. She's been dating Molner, a 50-year-old banker, for two years. Wonderful for her. Marriage is a good thing and I am happy she found someone to love. She is 6 years older than he is. Interesting. Six years isn't a problem. 25 years (Michael Douglas) or 40 years (George Soros) is. Oh how sweet. Dating for 2 years now getting married. So, how is this in any way remotely deserving a mention on here? THEY WILL BE DIVORCED IN ANOTHER YEAR OR SO! God people, get over the whole wedding thing ploooisse!!!! My guess would be that they live happily ever after, jerk! Well, that was rude and un-called for. Why must you always be so negative. Katie Couric is a popular person and I wish her only happiness. She lost her former husband and that was a tragedy for her.